In the past, there were many wild elephants to be found on Sumatra. Elephants often caused problems for the local population, because they destroyed rice fields and ate the harvest. Instead of chasing elephants, they are now trained to work in the forest and to be a tourist attraction. When the Sumatra railway was built from 1880 onwards, and direct telegraph poles were placed next to the rails, it turned out that many of these poles were pulled out of the ground almost immediately. This shows that in those days many elephants stayed in and around the Gunung Leuser area. 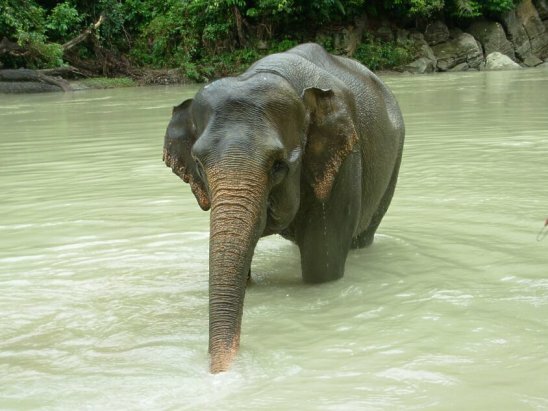 Today, the Sumatran Elephant is almost extinct. Only in a few places they can still be seen in their natural environment. Most elephants can be found in the elephant training center in Way Kambas near Bandar Lampung in South Sumatra. In addition, the elephants can also be seen in Tangkahan in North Sumatra. In Tangkahan, at the edge of the Gunung Leuser reserve, lies in an impressive jungle area where beautiful jungle treks can be made. In addition, the World Wild Life Fund keeps elephants that can be seen and washed. Book an exclusive tour to see the Sumatran Elephant with Tri Jaya Tour & Travel. Ask us about the possibilities and prices. From Medan it is about 6 hours driving to Tangkahan. It is not possible to return to Medan the same day. We can arrange a simple accommodation for you in Tangkahan. Contact us and ask for the possibilities and prices so that we can organize this unforgettable trip for you.